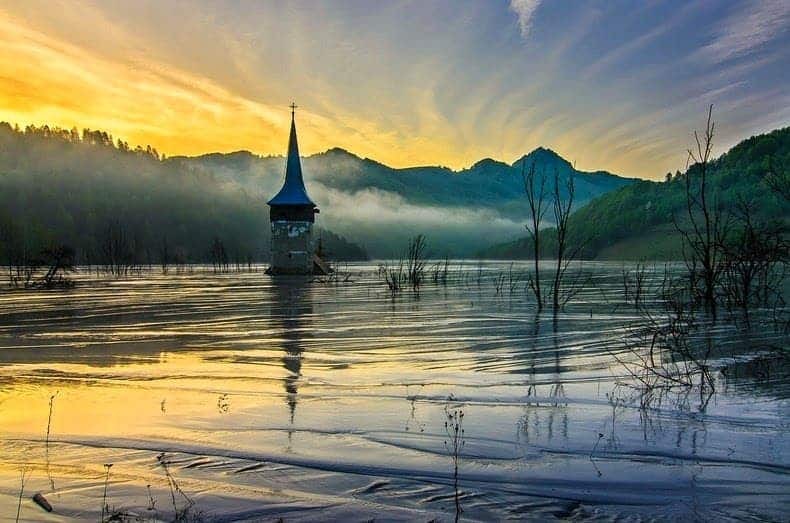 Geamana is an abandoned village in Romania. 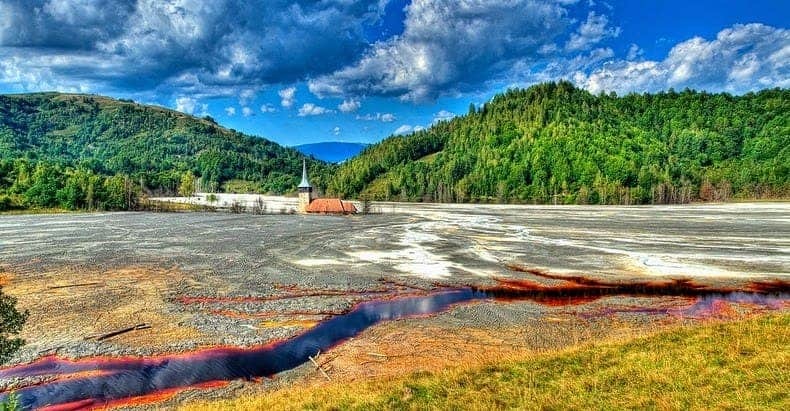 It was a very nice and happy village up until 1978, when the Communist regime forced residents to leave their homes and make way for the toxic waste from a nearby mining pit. 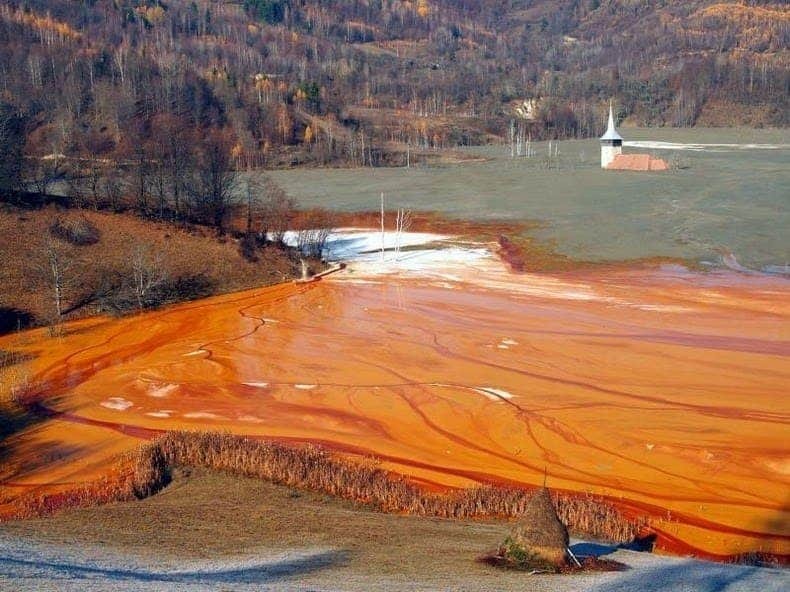 Everything started in 1977 when dictator Nicolae Ceausescu decided to exploit a huge underground copper deposit. In only one year, the work began and everybody from Geamana was evacuated. Image via Amazing Places on Earth. 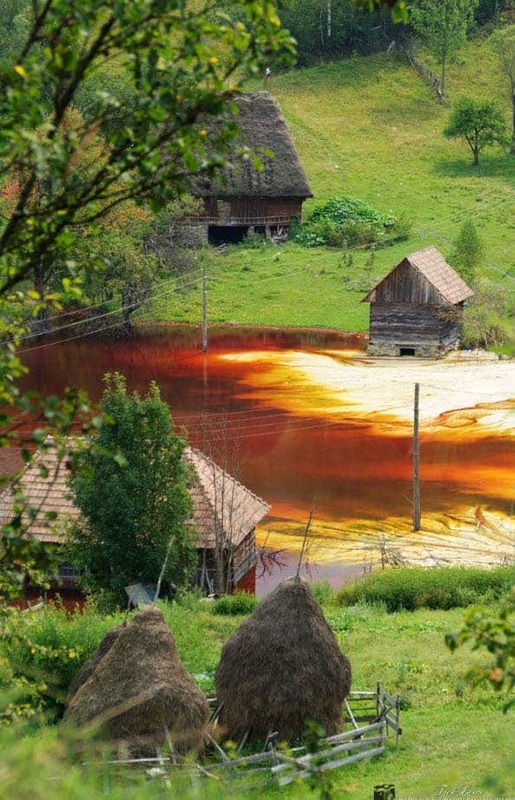 he nearby copper pit of Rosia Poieni in the Apuseni Mountains is still the largest copper reserve in Romania. 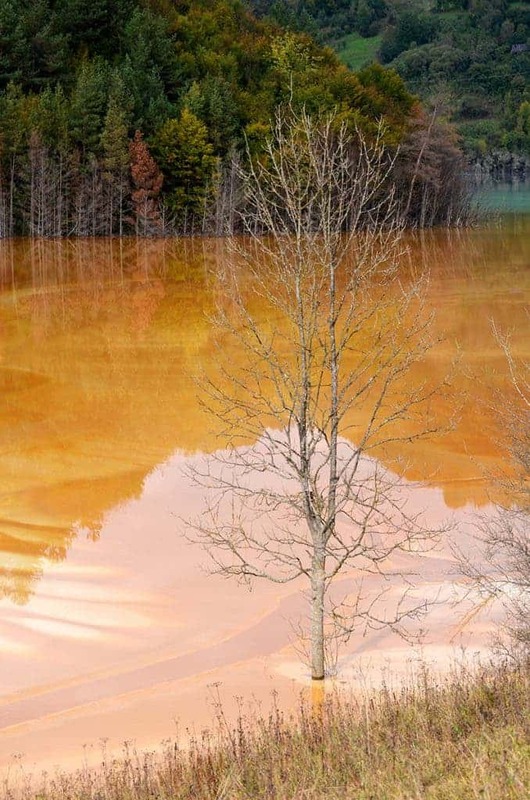 While the exploitation has stopped for now, It produced around 11,000 tons of copper a year in its prime. However, the mine also produced a lot of toxic waste that needed to be stored — the reason the Geamana village was sacrificed. 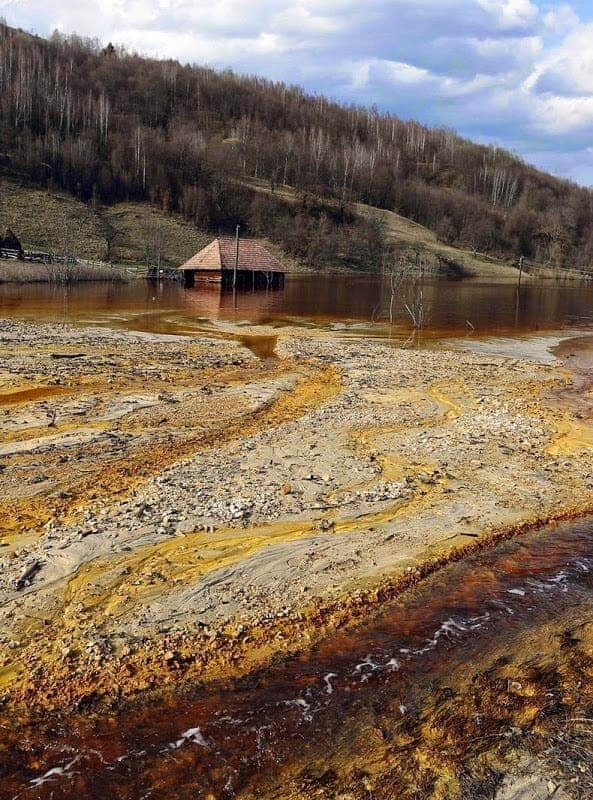 Some 400 families were evacuated from Geamana and their village was replaced by an artificial lake which functioned as a kind of catch-basin for the mine’s contaminated sludge. 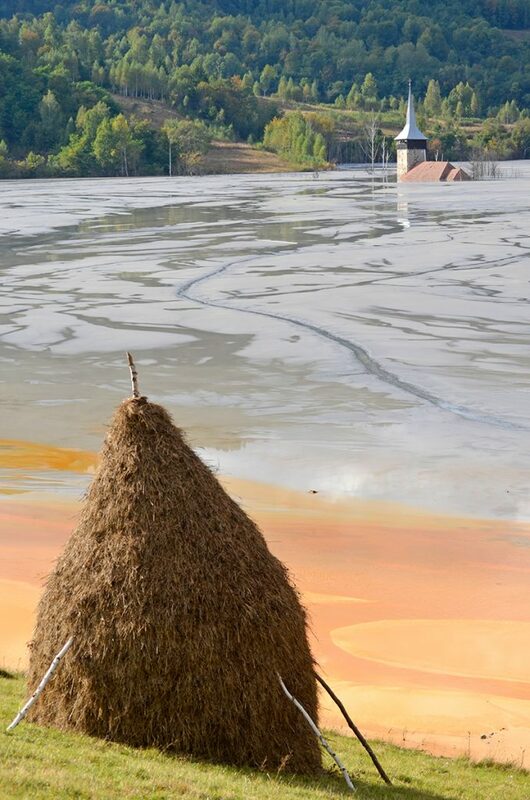 As the exploitation continued, the lake grew more and more, gulping up what used to be a village and creating the surreal landscape we see today. The acidic lake contains cyanide, which is used in the extraction process. The church and a few houses are all that remains of the village today. 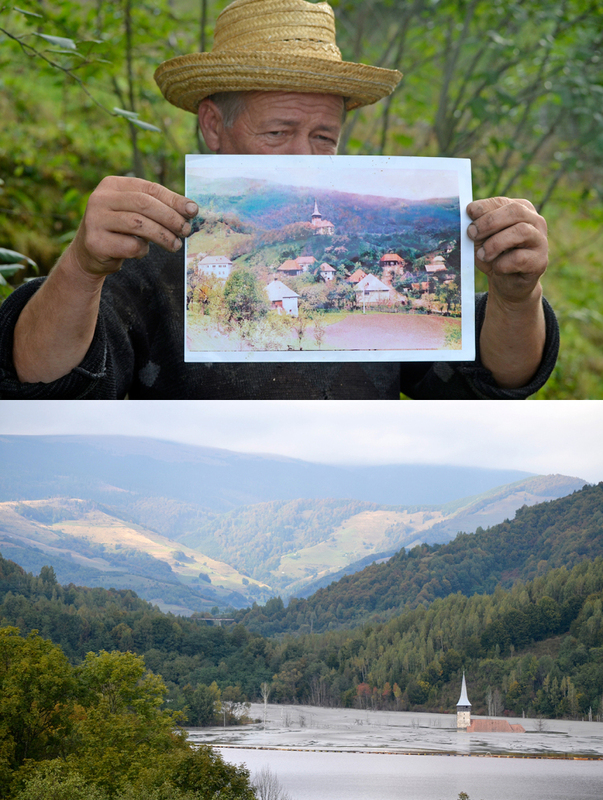 A local shows Adrian Ciubotaru what the village used to look like. Image via Adrian Ciubotaru. Many of the villagers thought that by agreeing to move they would get rich, as the government promised. They were supposed to be relocated to a new village 7 km from Geamana, but they were actually relocated over 100 km away, receiving just land and small amounts of money for their trouble. Out of the 1,000 people who once inhabited the area, 20 still live around the toxic waste. Their houses just happened to be higher up the hill — locals say that destiny placed them there. 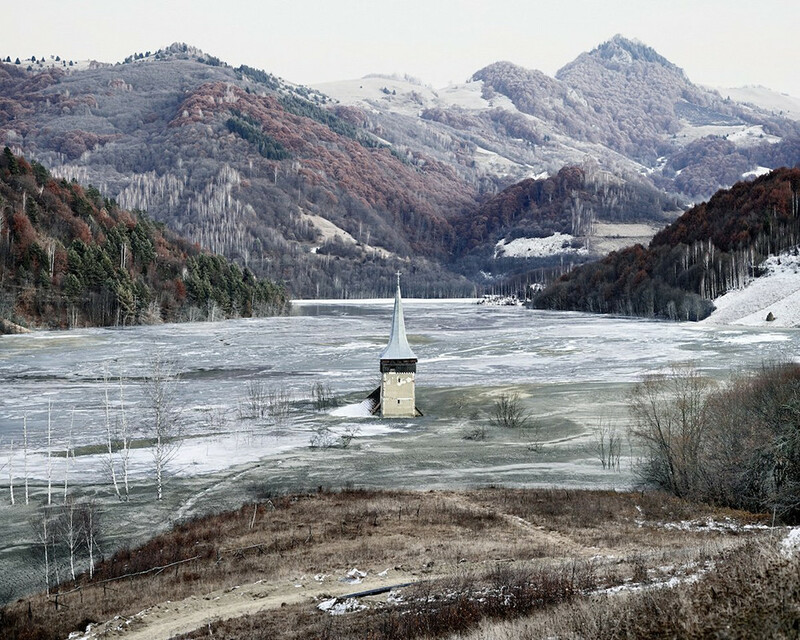 Locals are also extremely upset that authorities didn’t fulfill their promise to relocate the village’s graves, which are still around the flooded church. “First time, I came here to work as a postman. But after this happened, I realized that no one here needs a postman anymore”, said Cornel Pop, a local. Sadly, history might repeat itself. Another mining project is planned in the area. 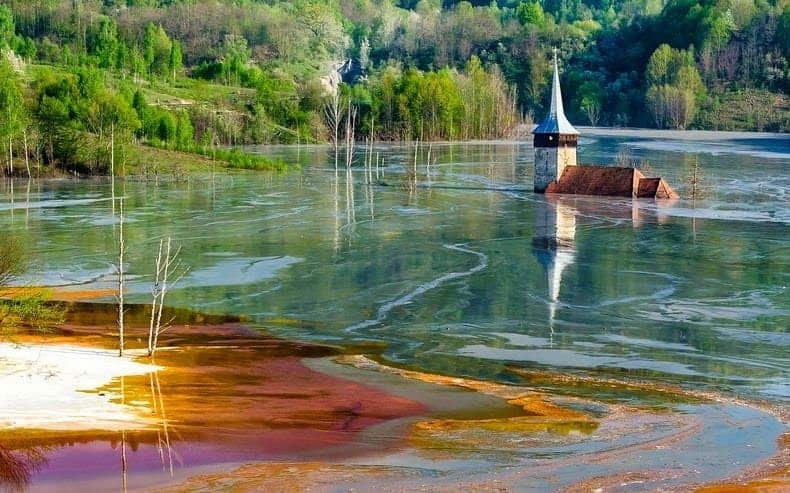 Romanian society has spoken out against this project, fearing another environmental and social disaster and for good reason — the Romanian government has proven time and time again that they are incapable of maintaining a high environmental standard. Corruption is running rampant through the country’s leadership, and people are aware of this. They don’t want another Geamana happening. Meanwhile, like a bloody bride, this beautiful landscape serves as a warning. Underground resources can come at a great cost — a cost that we will also have to account for.